Strawberry Alligator Gummis for sale. Buy online at Zingerman's Mail Order. Gourmet Gifts. Food Gifts. These certainly aren’t fancy, but they’re really good. 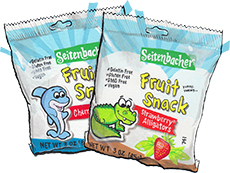 While most gummi manufacturers have pushed their product as far away from real food as possible, Germany's Seitenbacher has done the opposite. They use real fruit and all-natural ingredients. Each tastes just like the fruit they’re named for. Nothing artificial is added, so there’s no guilt involved in snacking. Heck, they’re even vegan, which is something I never thought I’d advertise. Of course kids like them, but make sure you get extra for the adults too. A super surprise hit at our store. They make a cute, sweet surprise for your honey.